Karnataka’s Flagship event on IT and Electronics is set to take off from November 28 to 30, 2016 at Bengaluru Palace Grounds. The event is organized by the Department of Information Technology, Biotechnology and Science & Technology, Government of Karnataka, in association with Software Technology Parks of India (STPI), Bengaluru. Bengaluru leads the country in IT exports and has emerged as the second largest technology hub in the world. Several companies including MNCs deliver cutting-edge products and services with thrust on new disruptive technological innovations. Bengaluru is a leading innovation hub which is home to over 4000 active tech Startups. It is the only Indian city to be ranked within the best 20 Startup eco-systems across the World. STPI has been playing vital role in supporting the IT, ITES and ESDM industry not only in policy implementation & monitoring but also in providing various Technology & Communication services which includes internet, datacenter, hosting, technology consultation, IT security audit, support for e-Governance etc. Keeping in view the fact that technological innovations happen in Bengaluru, the theme of Bengaluru ITE.biz 2016 event is ‘Define the Next’. The event will focus on Artificial Intelligence, IoT, Robotics, Big Data, Virtual Reality (VR) & Augmented Reality (AR), Electronics System Design, Animation, Visual Effects and Gaming, Apps Development, Startups, Entrepreneurship Development etc. The event spectrum would include keynote talks, powerful conference sessions, B2B Tradeshows, Experience Zone, CEO Conclave, Awards Function, Start-up Karnataka YESSS. It would be a unique blend of over 1800 registered delegates profiling C-level Executives, thought leaders, policy makers, technology experts, young innovators and investors. The 3-day event has the support of leading IT and Electronics Associations, such as NASSCOM, IESA, TiE, ABAI, Data Security Council of India (DSCI) etc. Countries such as UK, Germany, Netherlands, Korea and Japan are participating in various sessions of the event. Day-1 of the event is focused on Technology Leadership, Day-2 on the Emerging and Futuristic Technologies and Day-3 on Startups. Awards to top ICT exporting companies, best employers, best emerging companies etc, will also be given during the event. STPI will be conducting the prestigious IT export awards event on Nov 29, 2016 to recognise the performance of the IT, ITES and EHTP companies under 10 Major Awards Category with 24 sub-categories. An additional feature of this years’ ITE.biz is the co-location of Creativity World Forum-2016 with the theme, “Cities in Transition.” World Creativity forum, is an annual conference organized by the District of Creativity (DC) Network, founded in 2004 with 13 of the most creative and innovative regions around the world as its members and is being hosted in Bengaluru this year. The forum’s objective is to propagate concepts of creativity and innovation and foster sharing of knowledge and best practices. At the Curtain Raiser of the 19th edition of the event, UK Minister for International Trade, Rt Hon Greg Hands and Priyank Kharge, Karnataka Minister for IT, BT and Tourism, were present and spoke about collaborating in the field of technology innovation and promotion of entrepreneurship, especially in emerging and futuristic technologies. Rt Hon Greg Handsstated that as a first step towards a more lasting partnership, UK intends to sign a MoU to mutually support and strengthen the innovation ecosystems in Karnataka and the UK, targeting Startups and SMEs. 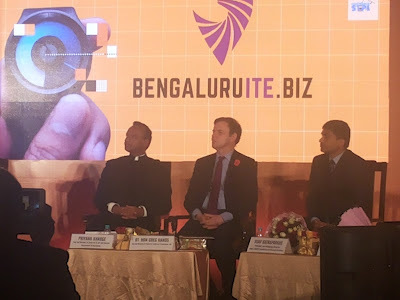 Priyank Kharge, Minister for IT, BT and Tourism highlighted the role of connected devices in the emerging digital economy having potential to transform the economy, business landscape, governance and society. The BengaluruITE.biz event would provide a platform for enterprises to partake in a digital solutions marketplace and create exciting experience for their customers. Principal Secretary, Department of IT, BT and S&T, V. Manjula, stated that the event has been instrumental in promoting the IT Industry for almost two decades. This year’s event is focused on providing opportunities to fuel innovation and promote entrepreneurship in new technologies, by convergence of software and hardware for connected devices. Earlier in the day, Priyank Kharge, Minister for IT, BT and Tourism, and V Manjula and senior officers of the Department participated in the roundtable organised by UK High Commission, wherein CEOs from UK and India working on Smart Cities, Cyber Security, Advanced technologies deliberated on potential business opportunities and partnerships. In a bilateral meet between the Minister of State for Trade and investment, UK and Minister for IT, BT and Tourism, Government of Karnataka, opportunities for mutual cooperation in the field of advanced technologies and furthering the growth of Startup ecosystem in both the countries were discussed.